The annual Two Icons Lecture examines the intersection of race and gender, and honors the legacy of Susan B. Anthony and Frederick Douglass. 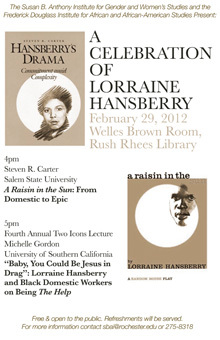 Michelle Gordon, Assistant Professor of English, University of Southern California, will give the lecture "'Baby, You Could Be Jesus in Drag': Lorraine Hansberry and Black Domestic Workers on Being The Help." This annual lecture is co-sponsored with the Frederick Douglass Institute for African and African-American Studies. The event is free and open to the public. Contact sbai@rochester.edu or 275-8318 for more information.